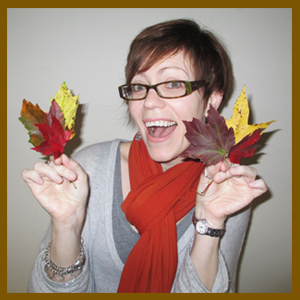 What can you do with fall leaves (besides walk through them and listen to that fabulous crunch, crunch, crunch!)? If the October/November edition of The Mailbox Preschool magazine is any indication, the answer is a lot! Here are some of the things we did with fall leaves—and you can easily implement them in your early childhood classroom as well. Lead youngsters in leaf-themed songs. Here’s a fun freebie song for you! Rake the leaves so orange and brown. Hear them make a crunching sound. Pick a pumpkin; wear a sweater. Birds fly south to warmer weather. So what do you do with fall leaves? I love the idea of leaves on the clothes line! We are learning patterns and what a great way to learn patterns while helping fine motor skills! Thank you for the idea! We used to have large beautiful trees in our playground. We bought little plastic garden rakes for the children and they had so much fun raking leaves (lg. motor) and then jumping in the piles they created. I loved fall at our school. I read “Leaf Man” to my 1st graders. After reviewing the illustrations, the kids make similar pieces of artwork with their leaves. I laminate the pictures and display them. I have my students glue the leaves they pick up in the school yard to large construction paper then we laminate it to make place mats. Leaves and other items from nature are great for teaching and reinforcing the concept of symmetry. Compare leaves, mark the lines of symmetry with a straw (a handy dandy tool for nature walks), and determine which leaves do not show symmetry. Ex: Poplar and maple are great for symmetry, white oak leaves are great for showing a lack of symmetry. I laminated leaves this year for leaf rubbing. I read the book Leaf Man and had the kiddos make their own leaf creations. The results were amazing.